The stunning 42 meter super yacht NATORI from the renowned Baglietto shipyard was launched February 14th, 2009. The build project was managed by Master Yachts. Baglietto mega yacht NATORI is set to become one of the most talked about vessels on the Mediterranean yacht charter scene this coming summer season. 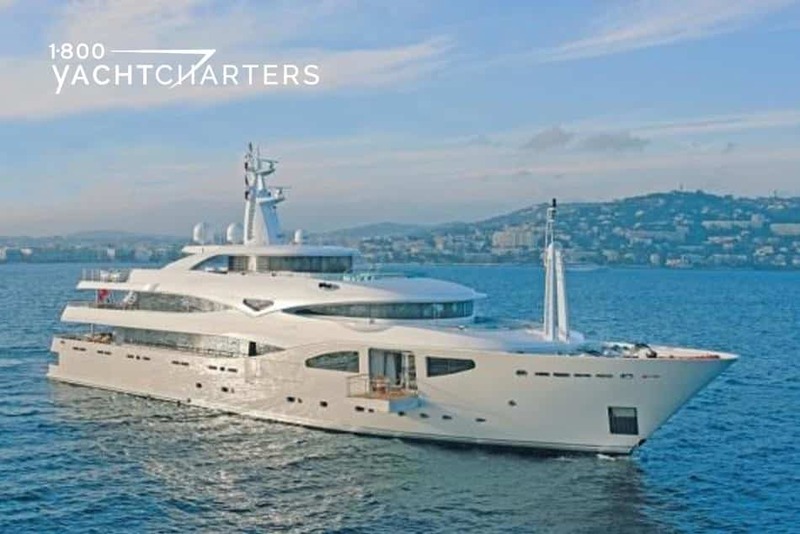 The newest and one of the largest yachts to enter the Mediterranean yacht charter marketplace in 2009, super yacht NATORI boasts a distinctive and avant garde exterior, styled by Francesco Paszkowski, and a beautiful interior designed by Bannenberg. The megayacht interior is a combination of Italian cabinetry, complemented with African materials to create a sophisticated and unique décor. Huge windows throughout her spacious interior create a variety of light, which is complemented by her unsurpassed outdoor deck space which is equal to that normally found on much larger luxury yacht charter vessels. The large bridge deck area has ample space for sun loungers and a shaded dining area for up to 12 guests. There is also a gymnasium on the bridge deck. Her sun deck houses a large pool area, designed by Bannenberg, which incorporates sun lounging space, seating area, and all’aperto (outdoor) dining space. Accommodation is for 10 guests in five cabins. The full-width master suite has its own private ensuite full-beam his and hers bathroom. On the lower deck, there are two twin cabins, one with a Pullman berth, as well as two full-beam VIP cabins, each with double beds. The megayacht boasts a full array of watersports equipment and all the latest entertainment systems. 1-800 Yacht Charters represents the Newest and Largest Yachts in the World’s Best Destinations. 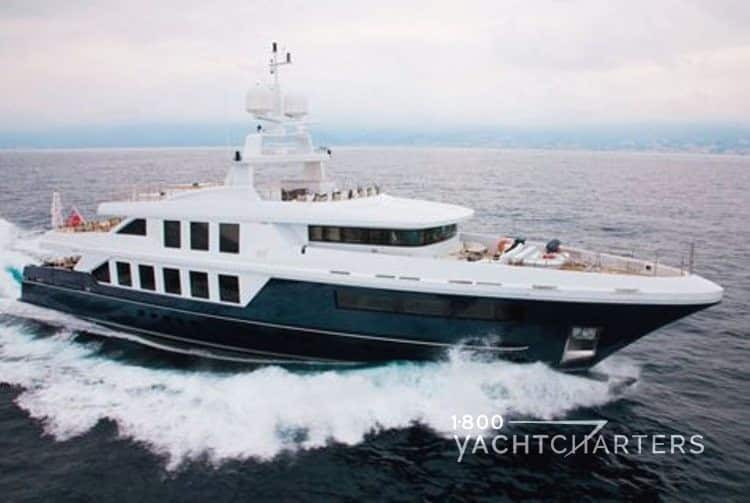 For more information on this yacht or any luxury charter megayacht, in any destination, contact the experts at 1800yachtcharter by email at info@1800yachtcharter.com or by phone: 305-720-7245. 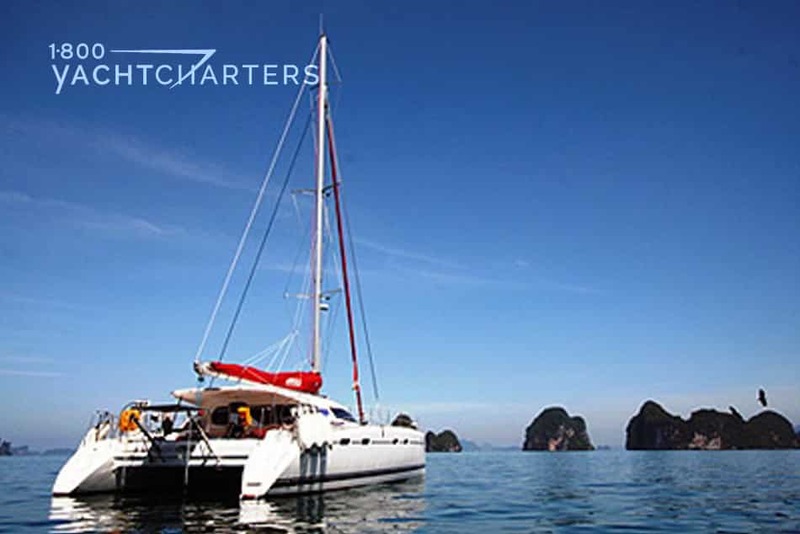 For your next vacation, why not book a bareboat charter in Phuket, Thailand on sailing yacht Amaia? She is a luxurious 47 foot sailing cat that offers variety in charter. For example, if you so desire, you can also have a crewed catamaran charter onboard, as well. Her abundantly-spacious exterior leads to a spacious cockpit which is perfect for enjoying a lazy lunch, relaxation, and some refreshing cocktails. Lots of options exist for your relaxation enjoyment, for instance, catch up on some reading or sunbathing on the front deck, or even listen to some music under the dazzling cockpit lights. Amaia can comfortably accommodate up to ten yacht charter guests for a bareboat charter, or 8 up to guests for a crewed catamaran charter. This superyacht is the ideal choice for your luxury Florida Yacht Charter vacation this year. She is a member of the Trinity Yacht fleet and is 48.90 meters (160 feet 5 inches) long. Blind Date can comfortably accommodate up to twelve guests in its five luxurious cabins. On motoryacht Blind Date, you will enjoy al fresco dining on the spacious upper deck, as well as wrap around seating if you want to chill out in front of the large outdoor flat screen TV. So if you wish to rent a private yacht to Florida this summer, charter the Blind Date and make it a vacation to remember. 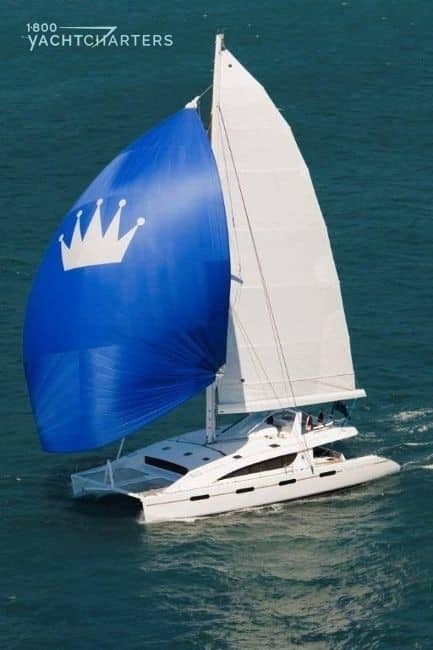 Kings Ransom is a new and popular charteryacht. This new 76 foot catamaran has all the latest advanced technology. She gives guests the most comfortable luxury cruise vacation experience. This cat has full air conditioning, as well as separate climate controls in all 5 ensuite cabins. Kings Ransom comfortably houses up to 10 guests, and it has luxurious leather and wood interiors in each cabin. She also features large storage spaces. Beginning 1st May 2010, Kings Ransom will be available for both Croatia Yacht Charters and the Mediterranean Yacht Charters as well. This lady is a breathtaking 54.20m (177’ 9”) luxury motor yacht available for your Virgin Islands Yacht Charter winter vacation this year. Because she has every luxurious amenity you can dream of, you are sure to find all you need aboard this superyacht! If she doesn’t have it, let us know, and we will source it for you! We are all about providing you the best and most incredible Superyacht Experience. She can comfortably accommodate up to twelve guests in her six luxurious staterooms. Her master cabin on the main deck has an emperor-sized bed. Her VIP cabin is on the upper deck, and the remaining cabins are below decks. Maraya has two spacious VIP doubles on the lower deck. She also has a twin cabin with additional pullman berths, as well as another twin cabin with a small double and a single bed on opposite sides of the yacht. One of yacht Maraya’s highlights is the master stateroom balcony terrace which can be lowered when she is anchored. This terrace, therefore, provides a very private outdoor relaxation area for guests. WHICH CELEBRITIES HAVE BEEN SEEN ONBOARD? You don’t have to been seen onboard, when you are THE OWNER! 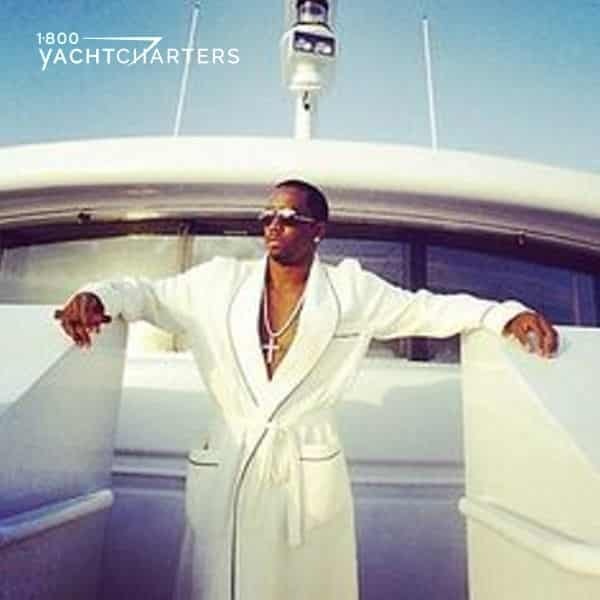 Multiple celebrities have chartered this yacht; for instance, Puff Daddy (also known as Sean Diddy Combs, P-Diddy, Sean Combs), who enjoyed yachti chartering so much that he purchased Maraya as his own. Tourists planning a Croatia yacht charter holiday on a superyacht or megayacht this summer, will be pleased to learn a new megayacht marina has opened – the Mandalina Marina and Yacht Club. 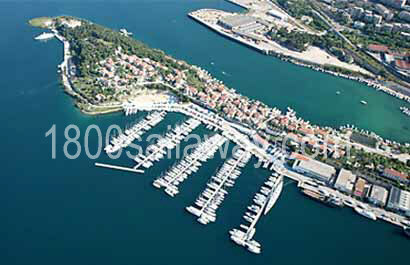 Located in the coastal town of Sibenik, the Mandalina Marina and Yacht Club is the area’s first megayacht facility. Special introductory rates for dockage are available for early reservations (see below). Considered the Mediterranean’s next great megayacht destination, interest in Croatia yacht charter holidays has spiked in the past 2 seasons. The new Mandalina Marina and Yacht Club sits at the crossroads of central and eastern Europe, along the Dalmatian Coast, long a haven for bareboat sailboat charter vacations. Chosen as "the world’s number one sailing destination" by National Geographic magazine, the site is noted for its proximity to Kornati Islands National Park and Krka National Park, two UNESCO World Heritage Sites. Sibinek is one of the oldest native Croatian towns and is noted as a center of culture and art. With the opening of the superyacht facility and with the Spilt International Airport nearby, Sibenik is destined to become the region’s premier gateway for luxury yacht charter and bareboat charter vessels. It offers convenient access to over 300 scenic islands on the Adriatic, as well as an outstanding hub from which to cruise the Eastern coast of Italy. The new marina and yacht club features a wide range of on-site conveniences for yacht crews and luxury yacht charter tourists. Twenty-four hour security and a full-time marina staff will protect and maintain the 350 in-water slips with space for superyacht vessels up to 280 feet. The yacht charter consultants at SailAway are pleased to accept inquiries for Croatia as many of the newest and largest yachts have announced plans to offer their services in the Adriatic. Some of the available yachts to charter in Croatia include SIREN, MARTHA ANN, CLOUD NINE, SALUTE, RED DRAGON, ALEXANDAR V, and ANASSA. Plan your bareboat yacht vacation or luxury crewed yacht charter now and take advantage of a special summer season dockage discount. Reserve your berth before April 15, 2009 and save 10% on your berth charges. Pre-pay for your berth and you’ll receive an additional 5% discount. Offer valid for stays May 1, 2009 through October 31, 2009. Conditions and restrictions apply – based on space availability. Contact our charter specialists at 1-800-BAREBOAT for bareboat berth information, and 1-800-YACHTCHARTER for crewed yacht charter information. Presenting superyacht Allure. 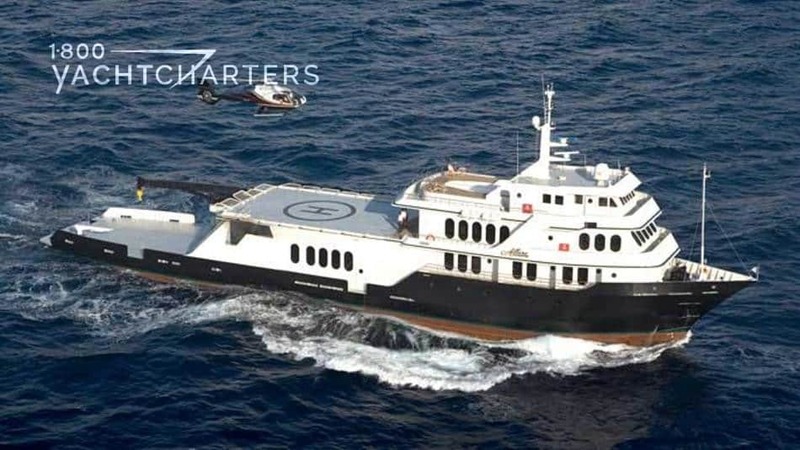 She is a 67 meter (220 foot) luxury motor yacht available for those thinking of taking a Greece Yacht Charter vacation this year. You may choose to rent this private yacht and charter it to provide you with a mother ship with additional specialized water toys, as well as a helicopter deck. She accommodates up to twelve guests comfortably in six (6) luxury cabins. What makes them luxurious? For instance, these guest staterooms have ample space, and each comes with its own private balcony. The yacht interior offers large large oval windows on the main and sky lounge decks through which to enjoy amazing ocean views. In conclusion, chartering a yacht like her is an amazing experience. To charter Allure or a different superyacht, contact us athttps://www.1800yachtcharters.com/book-now-contact-us/ TODAY! 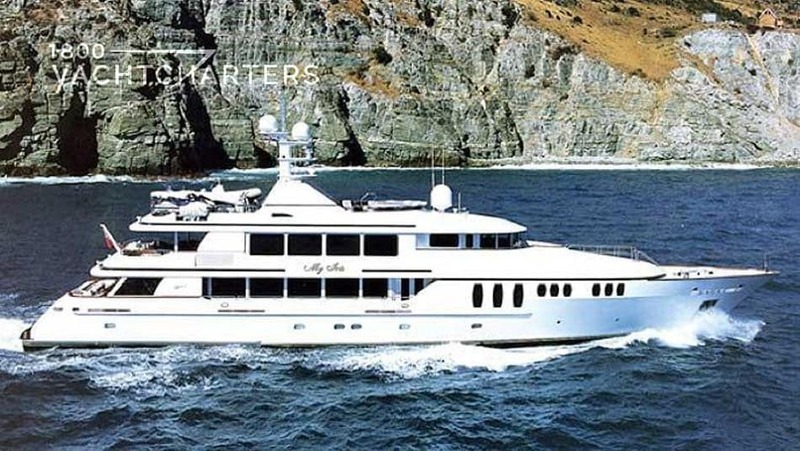 For your St. Martin Yacht Charter vacation this year, why not book an excursion on the sleek, gorgeous motoryacht, My Iris? WHO IS MOTORYACHT MY IRIS? She is part of the Trinity yacht charter fleet of superyachts for rent. My Iris can comfortably accommodate up to ten yacht charter guests in its five luxurious and spacious cabins. She features many water toys for watersports enthusiasts; for instance, wakeboards, SCUBA diving gear, waterskis, snorkel gear, kneeboards, and a wide selection of beach toys. For your state-of-the-art entertainment, you may choose between listening to music on the Sony CD player, or watching some films on the Pioneer DVD players. The Mediterranean yacht charter marketplace is bursting at the seams with over a dozen new builds in the past 12 months. Many of the newest yachts have been delivered to their owners and the luxury yacht charter crews are busy preparing these mega yachts for their Mediterranean yacht charter season. The eagerly awaited Benetti mega yacht AMNESIA and superyacht CRN Ancona MARAYA have now been launched to great acclaim. The 196.8′ (60m) megayacht AMNESIA is chartering in Croatia and southern Italy for the summer, before heading to the Caribbean for winter. Super yacht MARAYA, which translates as "many mirrors" spent part of 2008 in luxury yacht charter service, and her crew of 15 is eager to put in a full summer offering customers either a French Rivera yacht charter, or a Croatia yacht charter. With the Monaco Grand Prix and Cannes Film Festival close at hand, the volumes of deck space on this superyacht make her ideal for service as a corporate yacht charter vessel. Fresh from the shipyard, a number of smaller, more intimate yachts, suitable for 4 to 6 passengers, are eager to enter both the Western and Eastern Mediterranean Turkey and Greece yacht charter market this summer. Leading the way is the 2009 speedy 23 meter Aicon Spa yacht ENCORE, with accommodations for 6 to 8 guests. The super-charged yacht MISTER JINGLES, also built in 2009 and will be cruising from the French Riviera on down to the Amalfi coast at a blistering 35 knots. Another highly successful summer charter season is anticipated in the Mediterranean. 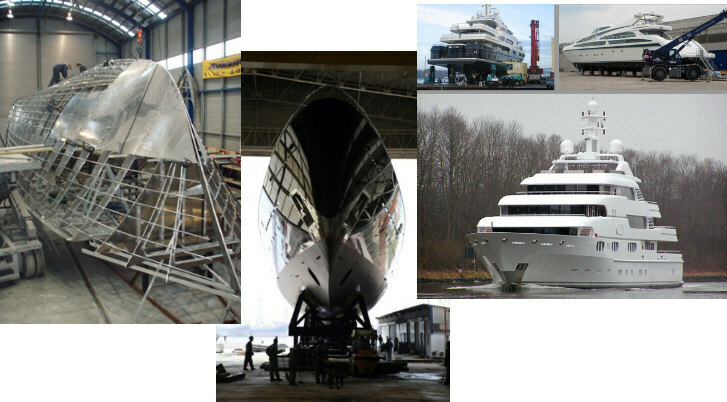 Keep your eyes opened for more new builds to hit the seas this spring. To see ALL of the newest and largest yachts in the world’s best destinations and to book your vacation of a lifetime or upscale corporate event, visit www.1800yachtcharter.com. lead the way with 14 new yachts up for the prestigious international award. Best Displacement Motor Yacht, 500GT to 1299GT. SEDATION for the Best Refitted Yacht award. of modern design and manufacture. Worlds’ BEST Destinations. Make your reservation today at 1800YACHTCHARTER.COM.